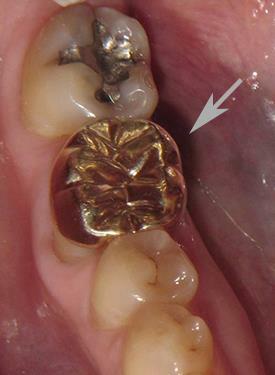 Our patient asked: Isn’t gold crowns the best because it is inert? Gold has been touted to be a good material inside the mouth because it is inert. While gold is indeed inert, the formulation to manufacture gold crowns consist of an alloy of metals (mixture of different metals). Pure gold is simply too soft. Other elements such as copper and platinum have to be added in small quantities to strengthen and give the crown favorable physical properties to withstand the harsh environment in the mouth. In the real world, a “gold crown” is made up of approximately 70-80% gold by mass. The problem with an alloy (or a mixture of metals) is that they each have different electrochemical properties. In a moist environment like our mouth, the difference in this electrochemical potential which will cause corrosion to occur. Indeed, it may be the best option of the metal crowns because other forms of metal crown have a larger mixture of metals. However, it is still a mixture of metal and it will corrode in the mouth. Over time, the margins of the crown will leak and decay can start beneath the crown – sometimes going undetected for a long time. Another issue is the reaction of gold crowns (or any other metal) to our gums – there has been anecdotal evidence that it may cause recession or shrinking of the gums. Wherever possible (in fact, in most cases), ceramic crowns are the better option over gold crowns. It is more biocompatible, can be bonded on to the tooth itself (as opposed to cementing gold crowns) and any decay or deficiency under the crown can be seen on X-rays. Image Dental has been metal-free for the past 12 years. Speak to us to find out more.